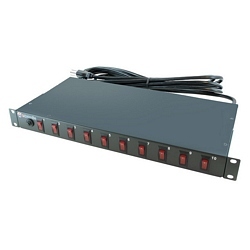 With 10 rear-facing outlets and 10 matching front-facing rocker switches, this AC power distribution unit delivers up to 15 amps in a rack mount cabinet with fixed mounting flanges. It occupies one rack unit (1U) and measures only 4 1/2" in depth. Unfiltered electrical pass-through is ideal for distributing alternate waveform UPS or generator power in rack enclosures, network closets and more. Includes 15 ft. power cord.